To set up a keyhole race you’ll need a flat area, such as a small field, riding ring, or arena. Use something to mark the starting line such as a line of wood shavings on the ground, pylons, bales of hay, or upturned buckets. You’ll also need to mark the ‘keyhole’. The keyhole will be roughly keyhole shaped. It will have an entrance and a large circle at the top. You can mark the keyhole on the ground with a line of chalk, flour, wood shavings, sawdust, or heavy rope laid out to make the shape. If you’re just having fun in the backyard with friends, you could drag your heel in the dirt to mark out the shape, mow the shape into the grass with a lawnmower, or use poles to mark out an approximate shape. For a more serious race, there are official dimensions for the keyhole race. The bottom of the keyhole which makes the entrance should be ten feet long and four feet wide. The circle should be twenty feet across. The measurement from the starting line to the center of the circle should be one hundred feet. Beyond the starting line, in the area you will be taking off from and stopping should be eighty feet long. This provides ample room for safe stops and starts. For informal gymkhanas, you don’t have to be exact, but the circle of the keyhole needs to be large enough for the horse to turn around in and there needs to be enough room to stop and halt safely. You will have to have a timing device at the finish line. Someone could time with a stopwatch or use an electronic timer. Timing begins when the competitor crosses the start line and ends when the competitor crosses back across the line to complete the pattern. The fastest times will come with a running start. This is the reason there is ample space before the starting line where timing begins. You cross the start/finish line and enter the keyhole, where you will turn your horse around and head back across the finish line. The race is basically a straight line, abrupt turn, and straight line back. The fastest time wins in a keyhole race. If a horse steps over the keyhole or touches the outline, it is disqualified, although, for fun, you could just add penalties instead. If you’ve got inexperienced riders, who are likely to have difficulty making the sharp turn, penalties may be less discouraging than disqualifications. Going fast is not always the most important thing. Riding the pattern accurately is as important. You may actually get a faster time by trotting the pattern than you would if you galloped and went off track. Your horse must be able to stop and turn quickly. These abilities require obedience on its part and clear leg and rein aids on yours. 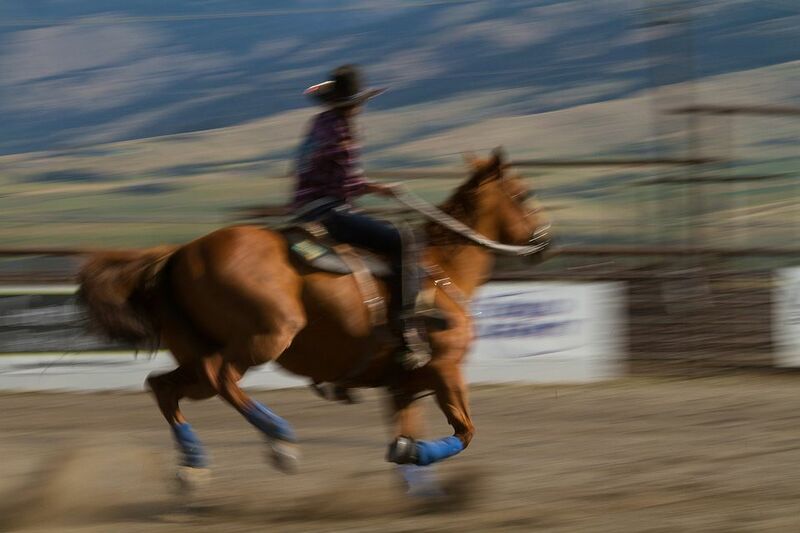 Yanking on the reins may only hurt and upset your horse. Stay calm and aim for accuracy. When turning, you may turn to the left or right. It doesn’t matter as long as you don’t step on or over the outline of the keyhole. Spotters may be used to watch that this rule is not broken. Be kind to your horse by not yanking on its mouth to turn it quickly. You may understand the point of the game, but your horse won’t. Don’t be surprised if your horse takes a second look at the chalk line or other markers on the ground. Some horses refuse to enter the keyhole when they first encounter that “strange thing" on the ground. A few slow practice patterns will help your horse get over any initial spookiness. Always wear your helmet, proper boots, and safety stirrups. Check your cinch or girth before racing; be sure it’s tight enough that your saddle won’t turn during quick stops and turns.